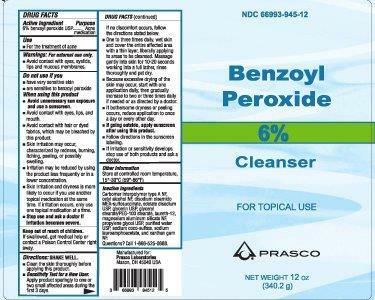 Proprietary Name: Benzoyl Peroxide What is the Proprietary Name? 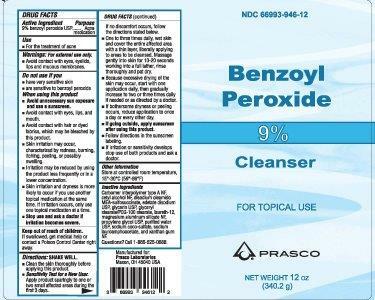 Benzoyl Peroxide with NDC 66993-946 is a a human over the counter drug product labeled by Prasco Laboratories. The generic name of Benzoyl Peroxide is benzoyl peroxide. The product's dosage form is liquid and is administered via topical form. Why is benzoyl peroxide topical medication prescribed? Avoid contact with eyes, eyelids, lips and mucous membranes. Avoid unnecessary sun exposure and use a sunscreen.Avoid contact with eyes, lips, and mouth.Avoid contact with hair or dyed fabrics, which may be bleached by this product.Skin irritation may occur, characterized by redness, burning, itching, peeling, or possible swelling.Irritation may be reduced by using the product less frequently or in a lower concentration.Skin irritation and dryness is more likely to occur if you use another topical acne medication at the same time. If irritation occurs, only use one topical acne medication at a time. SHAKE WELL.Clean the skin thoroughly before applying this product. One to three times daily, wet skin and cover the entire affected area with a thin layer, liberally applying to areas to be cleansed. Massage gently into skin for 10-20 seconds working into a full lather, rinse thoroughly and pat dry. Because excessive drying of the skin may occur, start with one application daily, then gradually increase to two or three times daily if needed or as directed by a doctor. If going outside, apply sunscreen after using this product. Follow directions in the sunscreen labeling.If irritation or sensitivity develops stop use of both products and ask a doctor. Carbomer interpolymer type A NF, cetyl alcohol NF, disodium oleamido MEA-sulfosuccinate, edetate disodium USP, glycerin USP, glyceryl stearate/PEG-100 stearate, laureth-12, magnesium aluminum silicate NF, propylene glycol USP, purified water USP, sodium coco-sulfate, sodium lauroamphoacetate, and xanthan gum NF.